A meme in the tech startup world over the last few years is that you should wait as long as possible to go public. While holding off on an IPO may be beneficial for a small number of startups (e.g. Uber, and Facebook before it) it may be harmful for a number of startups who are not, well, Uber or Facebook. In particular, as public market conditions worsen and tech IPOs are scarce, a number of companies may regret not having gone public in late 2015 when they had the chance to do so. Public markets are sources of ongoing capital, provide a liquid stock with which to both reward and compensate employees as well as to make acquisitions. Square was smart to go public while it was able to do so, just as PayPal did back in 2001. Once the IPO window shuts it becomes harder for many companies to raise money from public markets. However, the big names will always be able to go public irrespective of market conditions (e.g. Uber and AirBnB). 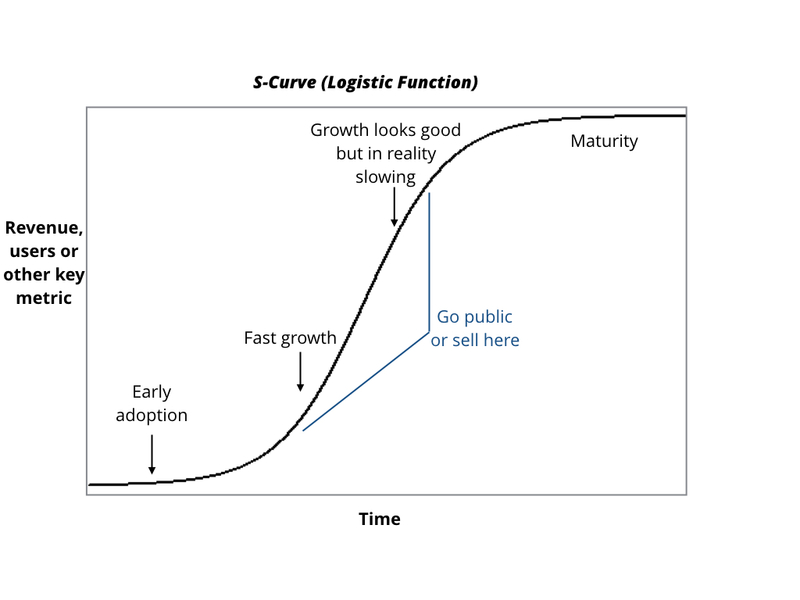 In general, you want to go public while you are still in the high growth part of the S-Curve (AKA the logistic function). The S-Curve is an old concept that describes the maturation of a market or company. Early in the life of a market (or product) there is a slow growth phase as early adoption happens. This is followed by accelerated growth / mass adoption. Then the market or company matures, and growth tends to slow down. In the mature phase competition may also be heightened and growth or margin may decrease due to competitive pressures. In general, investors reward fast growth and high margin in defensible businesses. If you go public while still in the high growth, less competitive phase of your business, you will be awarded a larger multiple on your stock. This more valuable stock allows you to hire great people and buy other companies, which hopefully helps you catch the next S-Curve and continue to scale the company and opportunity. 1. Ongoing secondary tenders & demand for your stock. At some point your employees and investors will expect liquidity. After a few years with your company, employees will need to be able to trade stock for cash in a secondary transaction in order to fulfill their ongoing life needs (school for kids, buying a house, medical emergencies, etc.). In order to provide liquidity for employees your company will effectively need to run a tender process or have company selected "preferred buyers" every ~12 months or so after your company is old enough (e.g. 5-7 years) and you have not gone public. If there is no ongoing demand for your stock, or demand begins to slide, employees will start to seek employers who can either pay them more cash, or have a liquid stock. This may be exacerbated if you switch to RSUs and then delay going public for too long a time. Since RSUs are typically tied to a liquid stock / IPO and are harder to liquidate from a secondary perspective, you end up with an inability for your employees to trade stock (which for early employees is likely the majority of their compensation at this point) for cash. The TL; DR is you lose employees due to a lack of liquidity. 2. Ever rising stock price. If the private market environment shifts and you can not raise money at ever higher valuations, your employees will start to view the company as sliding sideways and may consider alternative employers. This can happen equally with a public stock that is going nowhere, but in that case the employee has a greater opportunity to easily sell the stock on the public market and therefore less stress on the "true" value of the company. Also, if your company stock moves in concert with the rest of the public market, other risk-adjusted opportunities will appear similar to your employees - e.g. if the market tanks overall no one blames just your company. Note that (1) and (2) may be at odds - you may eventually raise at such high valuations that fewer secondary buyers are willing to buy your stock. Or, you may have tons of interest in secondary purchases of your stock since you have not reset your valuation with a primary financing. 3. Private stock that other companies will treat as liquid. In order to use your stock to buy other startups, you need people to think your stock is either fairly priced our cheap. This actually cuts both ways - if your stock is believed to still have a lot of upside, founders whose company you buy will view your stock as more attractive then public market companies with little likely upside. E.g. if you sell your company to Slack in exchange for stock and the stock appreciates 5X it might be a better outcome than receiving an acquisition offer with 50% more up front from a public company that is unlikely to move much stock price wise (e.g. eBay). However, a number of late stage companies may be perceived as overvalued. Since private market valuations are often opaque and illiquid, it might be harder to acquire a company than if you had a public company with the same valuation. Liquid stock you can use for compensation, acquisitions, etc. The market has priced your stock and at any moment you can find someone to buy it at that price. Customers may consider you more "safe" as a supplier or partner. Large enterprise companies may feel more comfortable buying things from you. Access to capital. Ultimately public markets provide you with the ability to raise capital and debt from a variety of sources. Financial discipline. You will focus more on revenue, margin, and profitability and (as long as you keep a longer term view) build a company that is hopefully more self-sustaining and able to subsidize new businesses. A friend of mine at Facebook mentioned when Facebook got hammered by Wall Street for the first time it forced the company to truly invest in ads, which has led to a higher market cap and increased the ability to buy WhatsApp, Instagram, Oculus, etc. People will work less hard once the lockup expires. I saw this happen first hand at a number of companies. Early employees will get distracted by their newfound wealth. Many will quit. You will attract more risk averse people. The hiring profile of the people who apply to Google or Facebook today is more similar to the people who would join McKinsey or Goldman Sachs than the people who would join a raw startup. This means your company will still hire really smart, driven people, but you will likely have fewer people willing to experiment or take risks. I should say one surprising trend I have seen is former serial entrepreneurs start to take "retirement" jobs at Google and Facebook. I.e. after a few rounds of tilting at entrepreneurial windmills they join a company like Google or Facebook for the good pay, more reasonable hours, and potential to make an impact. They bring their entrepreneurial energy to these companies, but also get to see their kids after work and not have the weight of the entire company on their shoulders. Lack of long term focus. Many public companies start to care too much about Wall Street's wishes, and loose focus on building long term sustainable value. Executives and employees may spend too much time watching the stock price and reacting emotionally to it. Turn arounds (e.g. Yahoo! or Dell) or large changes in direction become much more difficult as the public markets tend to punish truly innovative thinking if it comes at a short term cost. Extra overhead associated with public market compliance. Extra transparency in quarterly earnings reports and other SEC filings you are required to complete - competitors can understand your business in detail. Public markets are reactive and frequently irrational. I left Twitter about a year before it went public. Every time the company announced news I viewed as a net negative, the stock would move up. When the company announced news I thought was positive, the stock dropped. In general, public market investors may have keen insights on macro tends and financial aspects of a business, but they can often get things wrong too. This can create whiplash in your stock. A "Tender" is a company arranged program in which where a large buyer comes in and agrees to buy a bunch of common stock or early preferred stock from employees and investors in a single large transaction. People who own stock in the company typically have the ability to sell up to a certain dollar or percentage amount of their stock.